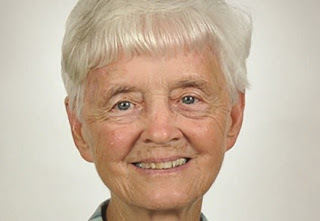 The Trinity School Family gratefully acknowledges the permission of the Sisters of Notre Dame de Namur, Ohio Province, to reprint this article first posted on the SNDOhio.com website on June 19, 2018. Catherine Phelps was one disciple who clearly took those words to heart throughout her 66 years in the ministry of education – at St. Martin’s in Washington, DC; and at Maryvale, St. Ursula and Trinity School in the Baltimore area. Her SND teachers from 3rd grade through high school, she wrote, “had an extraordinary influence on me.” At the heart of that influence was the way they introduced young Betty Mae Phelps to their foundress, Blessed Julie. “She became an integral part of my life,” Catherine testified at the time of her Diamond Jubilee as an SND. That joyous statement was in no way an exaggeration. In fact, it is rewarding to discover how St Julie’s charism quietly inhabits the language used by professionals relatively unacquainted with our foundress to describe Catherine’s person and achievements. There is a remarkable resonance! The Hall of Fame citation emphasizes a number of professional awards. Under Catherine’s leadership, Trinity was one of the first seven Catholic elementary schools to earn accreditation from Middle States and the Association of Independent Maryland Schools. Twice, the US Department of Education conferred Blue Ribbon of Excellence awards on the school (1989; 1999). Catherine herself was honored by the National Association of Elementary School Principals in 1989, and, three years later, was named Educator of the Year by the Howard County Chamber of Commerce (1992). But there is more to say. All her Notre Dame life, Catherine was “busy about many things” with amazing energy; but she never lost sight of “the one thing necessary” (Cf. Luke 10: 38-42). Liturgy was one of her special loves, and her gifts of music and prayer were put to good use in our Masses and prayer services over the years (as well as at Trinity School). She was a community woman par excellence, from her postulate and novitiate years onward. Her service on provincial committees and boards was generously and professionally given. She had a special regard for SNDs who were ill or up in years. Who can forget the Christmas gifts, cards and picnic lunches she brought to Villa Julie for the fortunate SND who had been missioned by province leadership to pray for the needs of Trinity School in any given year? Or the way Catherine in her 70’s and 80’s continued sharing her gift of song at parties and liturgies alike – long after most people her age can still carry a tune (“even in a bucket,” some would say)! Or how, in one SND’s words, Catherine was “a perfect lady, from head to toe,” simply but attractively dressed, always gracious, always warm. We cannot forget, either, where the gifts that flowered during Catherine’s adult life in Notre Dame had been planted and nurtured. 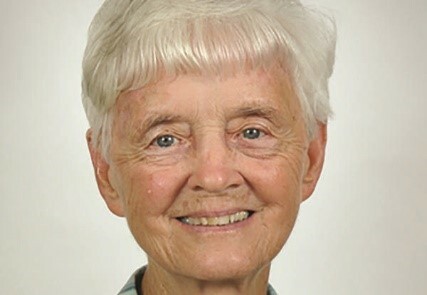 She never forgot: “I owe all the good qualities I have to my parents, especially my faith and energy to my mother, and I am grateful for the continued love and support of my sisters and brother,” she wrote in 2009, the year she celebrated 60 years as an SND. Our hearts go out to Catherine’s two sisters, Linda and Paula. Whatever our sense of loss – and it is profound – how can we complain that this valiant woman (Proverbs 31:10), at once Martha and Mary, has so suddenly and unexpectedly moved to a better place? St. Julie would have us remember that we can still meet her in the heart of Christ. And who of us would begrudge Catherine the fullness of joy that now is hers? She has indeed “chosen the better part,” and it will never be taken away from her!